← Backstage in MS PROJECT 2010! What do we have here? Manually Scheduled Summary Tasks, and how to deal with them! Hi, I will show you how to deal with Manually Scheduled Summary Tasks in MS PROJECT 2010! 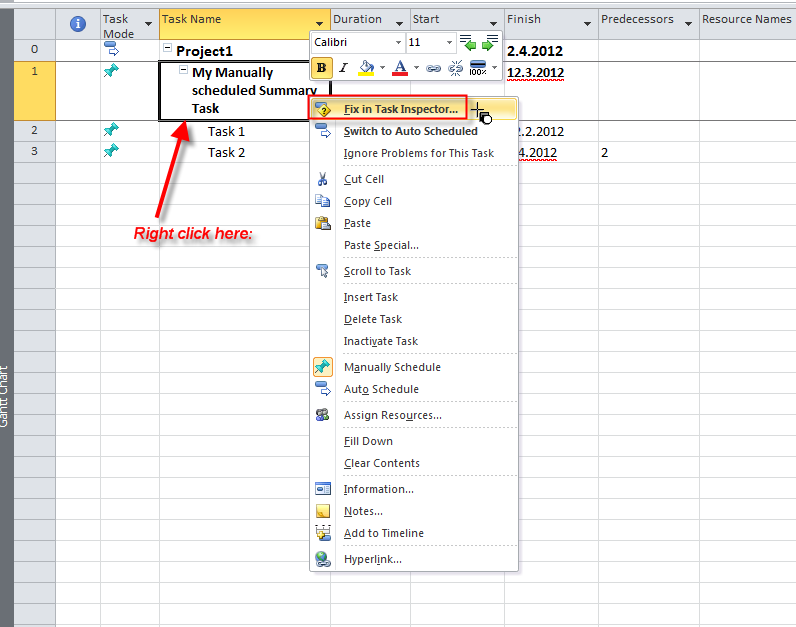 As you already know Manually Scheduled Task are new feature in MS PROJECT 2010, and those tasks are fully controlled by you. Notice that I put 15 days in duration field, and 21.2.2012 in Start Date. I will explain the Picture above. We have Summary Task with Duration = 15 days, Start Date = 21.2.2012, and End Date = 12.3.2012. 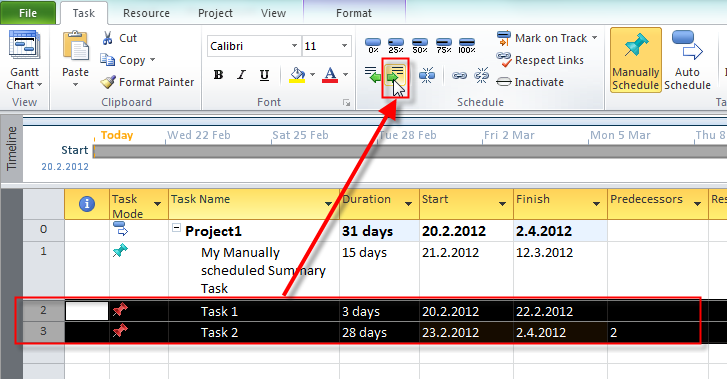 But Task 1 has Start Date = 20.2.2012 (one day before Summary Task, because this is Project Start Date), and Task 2 has Finish date = 2.4.2012 (because duration is 28 days). Notice red line in the Gantt Chart Part. This line represent the “real schedule warning” e.g. it represent variance between Tasks and Summary Task. Notice two other things. First, dates underlined with green and white color represent schedule conflict. Second notice that in Gantt Chart Task 2 is surrounded by doted lines, which represent schedule conflict! Extend finish date od task. If you choose this one, Summary Task will have finish date 2.4.2012, but Start Date remains same. Change dates but keep task Manually Scheduled. If you choose this one, Summary Task will have start date 20.02.2012, finish date 2.4.2012, and mode for this task remains Manually. Switch task to Auto Scheduled. 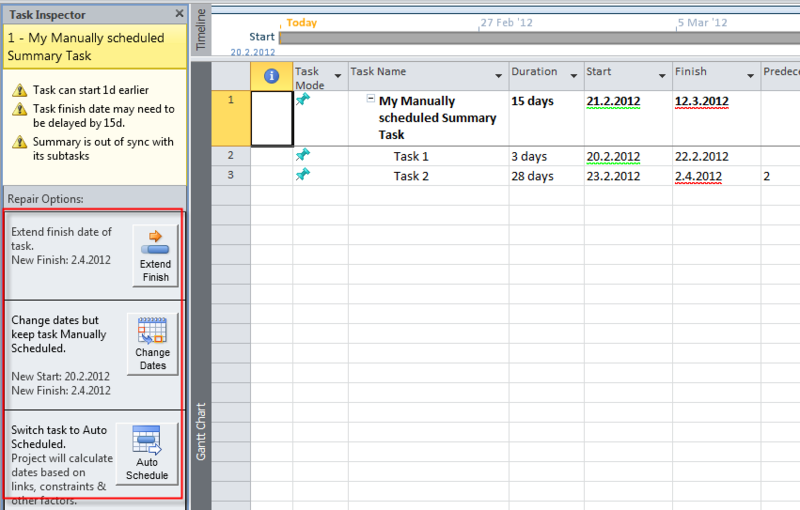 If you choose this one, Summary Task will have start date 20.02.2012, finish date 2.4.2012, and mode will change to Auto. Notice, that Summary Task is now in Manually Scheduled mode! Some people consider it a BUG! but it is not! What really happens here is: YOU DICIDED TO TAKE CONTROL OVER THE SUMMARY TASK FROM MS PROJECT 2010, and only way to do that is to switch from Auto to Manually Scheduled mode. This entry was posted in MICROSOFT PROJECT, Microsoft PRoject 2010, MS PROJECT 2010, PMI, PRoject Management and tagged Micrrosoft Project 2010, MS PROJECT, ms project - scheduling, PMI, Project Management. Bookmark the permalink. 2 Responses to Manually Scheduled Summary Tasks, and how to deal with them! Any guidance or recommendation you can provide is helpful. Read the Blog Post from December/04/2013. I gave you an answer!